"Day of the Dead Special"
"My Trip to Latin America Residency"
Preschool. Elementary School, Middle School or High School. Also ideal for cultural programs and community events. Our Most popular hands-on workshop. This workshop will provide participants with information about Latin American culture as seen through the musical and oral traditions of the Indigenous, European and African peoples. A vast number of musical instruments from each of these cultures will be displayed, demonstrated, discussed and played by instructors and participans, with very brief playing instructions. Instruments used include drums, rattles, whistles, thumb pianos, stringed instruments, bells, rasps, turtle shells, conch shells, seed pod rattles, bamboo drums and many other unusual ethnic musical instruments found in the Americas today. Experience the sights and sounds of musical instruments used since ancient times. During the hands-on demonstration, artists explore instrument origins as a product of cultural migrations. The presentation discusses the environmental and symbolic significance of musical intruments in human culture and takes a close look at construction materials and their evolution. Always involves the audience in making music. Bone, wood, seed, string, hide and stone instruments. Elementary School, Middle School or High School. Workshops include Native Instruments of The Americas, Music of North and South America and Music of Africa. two string guitars drums berimbaus kalimbas rainsticks xylophones. Participants are introduced to the tools, materials and construction techniques needed to build their own musical instruments. Based on traditional designs and principles, string, wind and percussion instruments are built from readily available precut kits of natural materials. Grades 3-5, Middle School or High School. Also perfect for cultural program outside school hours. Enjoy the humor and wisdom of oral tradition through the telling of legends, myths and tall tales. Stories from native peoples of the Americas and Caribbean combine with 500 years of cultural infusion to create a unique folklore. This heritage reminds us of the importance of story telling throughout the ages. Elementary School or Middle School. Workshops include Creation Stories, Coyote Tales, Game Songs and Animal Stories. The purpose of this Arts in Education Program is to introduce students to a unit of study centered on all aspects of the rainforest environments in the Americas. Music, musical instruments, songs, stories and sounds that imitate those found in the rainforests will be used as departure points for discussions and research projects that will involve all students. Careful planning in close collaboration with the classroom teacher will lead to activities designed for the understanding and in-depth study of various rainforest concepts appropiate to the group's grade level and curriculum. 1 to 5 days visits. Concepts presented: The environment is everything around you, All things in the environment are interrelated, You can have an impact on your environment, All living things need clean air, water, shelter, food supply, etc. During a classroom workshop with a group of students grades k-12, we will explore the history, dance and musical influences of the three primary cultures found in modern Latin American and Caribbean countries. In this 45 minutes hands-on workshop students will be introduced to the various types of instruments and styles of music played by people of Native, European and African origins and how it relates to the music being heard today throughout The Americas. Students will have a chance to play some of the instruments presented. They will also try some songs and dances from the three cultures. After the initial classroom presentation, classes may be divided into smaller groups of students to work on the design and construction of their own musical instruments or to work on group and individual dances and musical pieces. Students may choose from a variety of percussion and melodic instruments. All materials are cut and prepared by the instructors before the workshop. Materials used cover a wide range of natural, recycled and bought elements. Cost is $5.00 per kit. Students may also choose to find their own materials from a list provided by the instructor. Alternatively, older students may construct an instrument of their own invention with guidance supervision from the instructor. Some tools that may be used for these activities will be provided by instructor. Dances covered will be generic or modeled after authentic examples viewed on video. They will learn about the cumbia, the rumba, the samba and the story dances of Mexico. We also touch on pre-conquest and colonial dances from Messo-America. In addition to the above described workshops, selected groups of students will work with members of Sirius Coyote to learn rhythms, songs in spanish and dances from the cultures presented on first contact day. 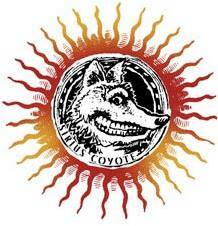 Students will have a chance to work towards a performance with Sirius Coyote using the instruments they have made and the songs and dances they have learned and rehearsed. Students may also do other activities such as writing about their experience, drawing/painting, story telling, games in Spanish and ecological studies of the enviroment presented. Special attention will be given to the oceans, deserts and rainforests of Latin America. Integration of activities with core school curriculum will be emphasized. Teachers inservice recomended. Block booking discount prices apply. "LATIN AMERICAN CULTURE AND HISTORY THROUGH ITS MUSIC "
With Giovanni Ciarlo and Kathleen Sartor. This inservice presentation for teachers will provide participants with information about Latin American culture as seen through its musical, oral traditions, artifacts and history. Participants will learn to value the complex and little known elements of Latin American culture of today. They will be provided with a set of suggested cultural goals and a series of practical classroom suggestions which can be used in developing or upgrading their existing curriculum and to better understand students of Hispanic background..
1. Introduction: "The Formation of a Mestizo Race"
OUR SCHOOL PROGRAMS ARE AVAILABLE THROUGH YOUNG AUDIENCES OF CONNECTICUT: 203-230-8101.